Alain is new lecturer at Bournemouth University, teaching on the Games Technology/Games Programming courses, and this is an opportunity to learn about his PhD research. Abstract: Photographic images are represented by a grid of pixels. Each pixel has a colour value (3 different ones for RGB colour Images) so that computations are very easy to do. However the number of pixels that are available is increasing at a faster rate every year. Images also need to be transported as in every other digital information. Two problems are arising with the growing amount of pixels. How can 4K images will be transported over the internet? How long will it take to compute 8K images? Those questions are tackled for the moment with better compression techniques and faster CPUs, but they have their limits. 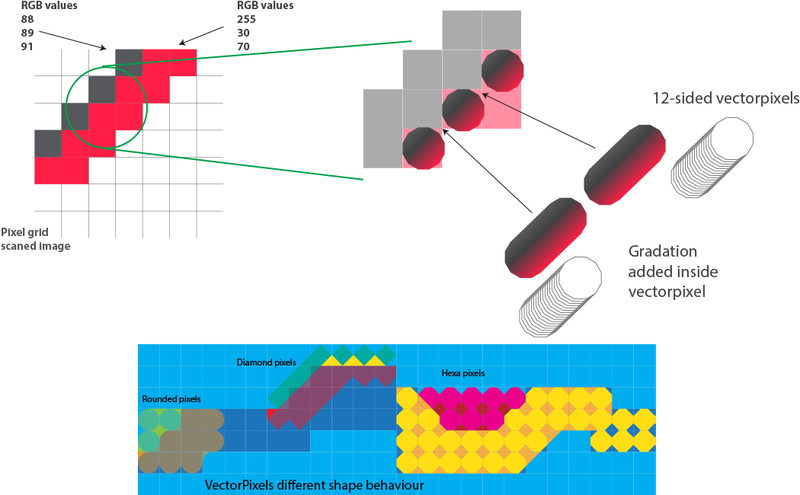 VectorPixels want to start from scratch, a new approach, a new algorithm to visualize images on screen. No hardware is available at the moment to capture VectorPixels so for creating VectorPixels ordinary pixel information will be used. Our algorithm is made up of three components namely trace, calculate and save. A VectorPixel is a vector based pixel as the word itself indicates. Abstract: “Without accurate physics simulation, even the most beautiful game feels static and lifeless”- PhysX. Developing fundamental computational algorithms and software pipelines that can truly unleash the power of physics simulation in computer games has been a major research activity in computer graphics. This talk will present soft body simulation algorithms and a scalable software framework that are capable of handling simulation realism and computational efficiency to satisfy unpredictable user interactions and fast responses in computer games. Soft bodies such as cloth and solid deformable objects offer special visual effects in film, computer games, virtual reality and medicine. These objects are not only computationally expensive to simulate due to a wide range of material properties, but are also difficult to design and to control the simulation effects. This talk will also describe the latest research direction in how to develop institutive tools by deriving mathematic expressions using simple curves. Designers can then edit physics via direct modifications of curve profiles since they represent underpinning physical behaviour of the soft bodies. We would like to invite you to the first research seminar of new academic year for the Creative Technology Research Centre. Abstract: Music is essential to most of us. It can light up all areas of the brain and help to develop skills with communication and establishing identity. People use musical experiences to create meaning and coherence in states and times of adversity using its transformative properties. Music can be explored actively by playing instruments, or passively, such as listening to music and can be used to enter a state of flow. Exploring music actively in this way can be restricted for someone with cognitive, physical, or sensory impairments. The barriers they face may cause gaps between their musical gestures and the music making means available to them. Using technology, we can bridge these gaps by focusing on a person’s capability to create personal instruments that allow for active music making and exploration of sound. Technology can be used to turn tiny movements into huge sounds and tangible user interfaces can be used to investigate the relationship between the physical and digital world, leading to new modes of interaction. 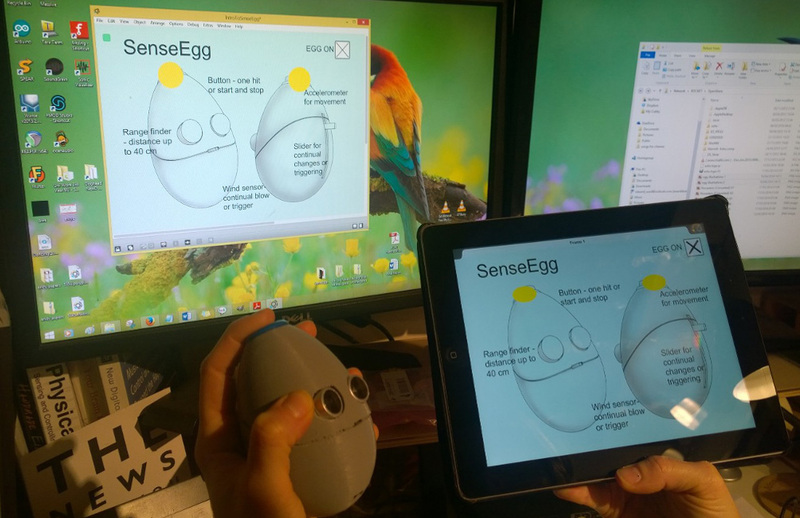 My research will take an Action Research approach to create bespoke tangible tools that combine hardware and software, allowing users to create and explore sound using their capabilities in a participatory way. Who can participate? 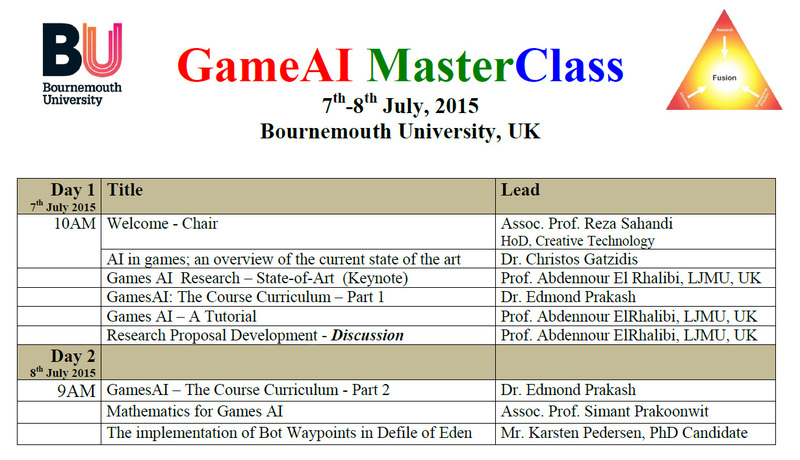 Students, researchers, lecturers and professionals in computer games technology, games programming with interest in GamesAI can participate in the MasterClass. The FIF funded collaborative project between the Creative Technology and Archaeology Frameworks has produced another output. A visualisation of the Iron Age banjo enclosure discovered in the Bournemouth University Durotriges Big Dig at Winterborne Kingston has been produced using Unreal Engine 4. The system allows users to explore the environment as it may have appeared in the Iron Age at a human scale. This was a pilot study that was produced as part of a Fusion Investment Fund project at Bournemouth University in collaboration between staff and students on the Archaeology and Games Technology courses. 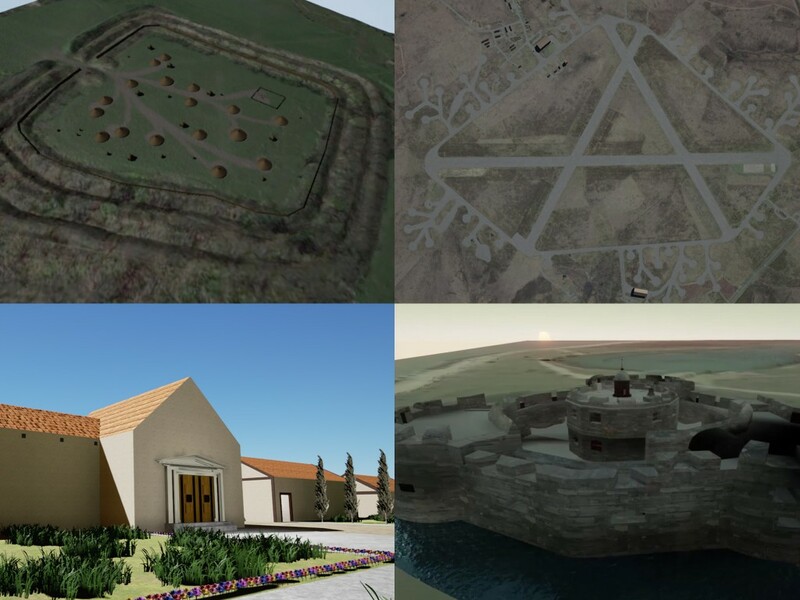 It is anticipated that the environment will be further developed by Games Technology students as part of their final year project studies with enhancements made to the existing environment and with the addition of visualisations of the same site at different historical periods of habitation. For more information about the visualisation please contact djohn@bournemouth.ac.uk. Abstract: Social media has continued growing in Saudi Arabia. Millions of businesses and trades are now using social media for entertainment, advertisement and promoting themselves internationally. Social networking sites, like Facebook, Twitter, YouTube etc., have gained huge popularity at personal as well as professional scale. Therefore, work is being done to evolve the modes of communication over these platforms, extensively. My research explores the effect of Saudi cultures on the design of social media site of Facebook. This talk presents the updated results of the research and proposes a theoretical framework that guides the design of a user interface for Facebook to meet the Saudi’s expectations. 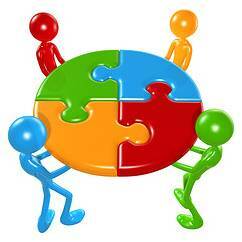 Abstract: Collaborative games require players to work together on shared activities to achieve a common goal. These games received widespread interest in the past decade, yet little is known on how to design them successfully, as well as how to evaluate or analyse them. This talk will describe a research project that aims to deliver a better understanding of collaborative processes designed in the mechanics of Collaborative Decision Making Games (CDMGs) in which collaboration takes place during the game play process at conscious cognitive level. To follow the aim, Collaboration Engineering (CE), a discipline that has studied collaboration for decades is used as a theoretical guideline to analyse and design CDMGs. At the analysis stage of this research, the primary focus is on understanding how CE is used in the design of the mechanics of CDMGs and within the design stage the goal is to demonstrate a pattern-based approach, developed using CE principles, which is then applied to the design of these games. Potential insights from this research make clear in what contexts CE is relevant and what kind of role it can play both in terms of analysis and the design of CDMGs. Title: Investigating and Visualising the Effects of Environment on Prey Detection Rates: A Key Variable in Human Evolution. Abstract: This project utilises interactive 3D virtual worlds in order to determine the effect which the composition of the environment has on the ability of humans to detect prey animals within it. The research focuses on the environments found in Europe prior to the Last Glacial Maximum, during the time period known as Oxygen Isotope Stage 3 (circa 30-55K years ago). 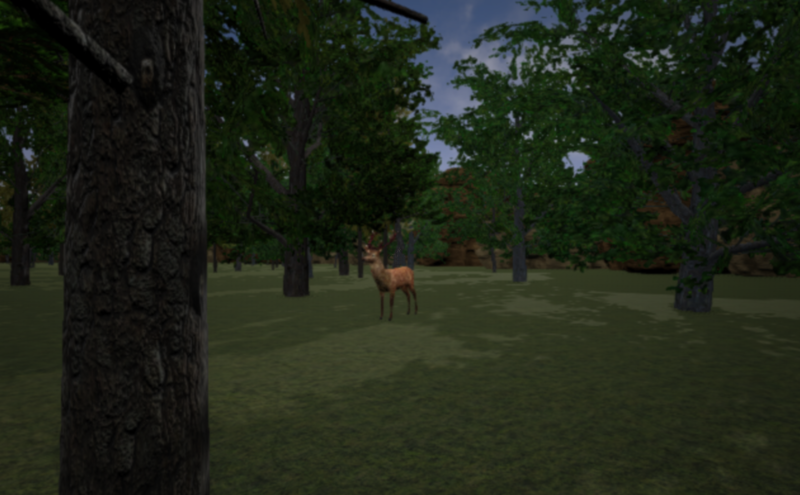 By recreating various OIS3 environments virtually, we can investigate the effects of “openness” (degree of forestation), light levels, terrain and many other factors on prey detection rates. Data is collected via experiments in which participants are able to navigate realistic 3D environments to search for prey animals. The search strategies they employ and the effect the environment is having on them can be recorded both from the software itself and via sophisticated eye-tracking technology. This data will inform us of the hunting strategies utilised by early human societies as they reacted to the changing landscape during OIS3. This project makes use of Unreal Engine 4, a technology well suited to the creation of large, complex, interactive virtual worlds. UE4 is mostly associated with large-scale games development projects, but has the flexibility for use in this kind of research, often referred to as serious games. 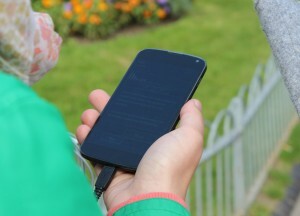 Increasing usage of mobile devices has changed the way we perceive and connect with our environment. Location-based Augmented Reality games turn urban spaces into playgrounds in which stories and playfulness unfold their potential and create unique experience based on existing physical and historical elements mediated by mobile technology. Introducing these games into the context of travel and tourism, not much is known by game designers of how to address the requirements of tourists in order to create engaging experiences with the urban physical environment. 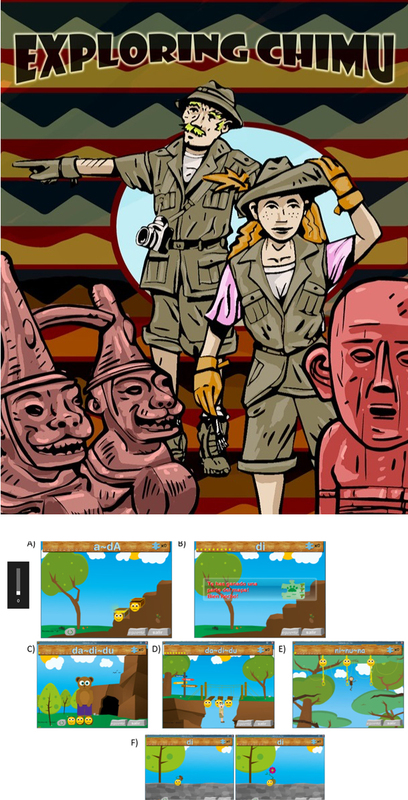 This study explores the game experience of tourists with two location-based, mobile AR games during playtests by combining mobile HCI, game design and tourist experience theory in order to understand the interaction with these games in a tourism context. The study applied a triangulation of qualitative methods to develop a theoretical framework for location-based, mobile AR games to create engaging experiences with the tourism urban environment. Many pieces of music exhibit returning and recurring identities founded on melodic, harmonic and rhythmic patterns and formations, appearing both locally and more globally within a work. In acousmatic music making i.e. 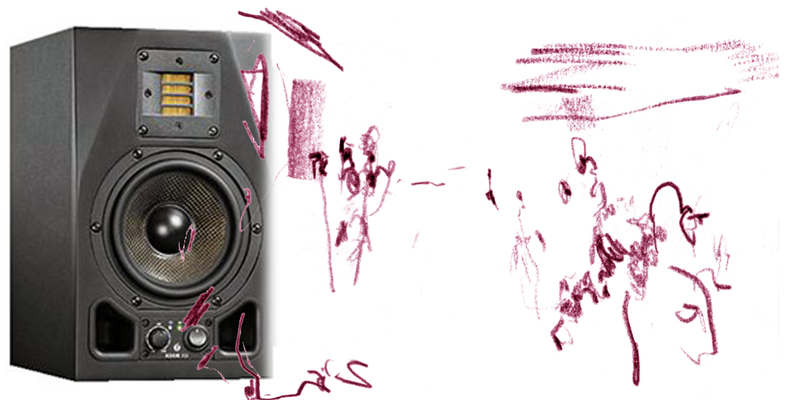 music for playback over loudspeakers only, the kinds of sound material and the possibilities of sound transformation are sufficiently different and broad that concepts of recurrence within this compositional context are valuably explored. In this talk I will present some of the ideas developed through my research and compositional practice concerning correspondences amongst the sounds within a work and organising those sounds, with a focus on my more recent acousmatic music outputs. Nowadays, linear power supplies are widely used to provide the supply voltage rail to an audio amplifier and are considered bulky, inefficient and expensive due to the presence of various components. In particular, the typical requirements of linear designs call for physically large mains transformers, energy storage/filtering inductors and capacitors. 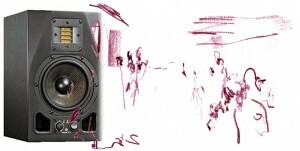 This imposes a practical limit to the reduction of size and weight in audio power systems. In order to overcome these problems, Switch-mode Power Supplies (SMPS) incorporate high speed switching transistors that allow for much smaller power conversion and energy storage components to be employed. In addition the low power dissipation of the transistors in the saturated and off states results in higher efficiency, improved voltage regulation and excellent power factor ratings. However, the use of SMPS in audio amplification is not novel in itself, the contribution will arise from design optimisation to achieve the lowest possible harmonic distortion in the audio output stage. Therefore, the primary aim of this research project is to develop the novel low noise switch mode power supply for an audio power amplifier. It will also strive to elevate the reliability of SMPS through stability analysis and enhance the efficiency of power supply through high speed switching transistors. As a result, the research will aim towards changing the way industrial manufacturing of power supplies for audio amplifiers are carried out. It will also provide a new path for researchers in this field to utilize the SMPS in all other audio devices by further enhancing its efficiency and reducing system noise. I’ll be discussing recent collaborative work with choreographer Ian Spink involving transdiciplinary practice across several projects in Scotland, as well as past work with choreographer Claire Pencak and archaeologists Antonia Thomas and Dan Lee at the Ness of Brodgar site in Orkney. 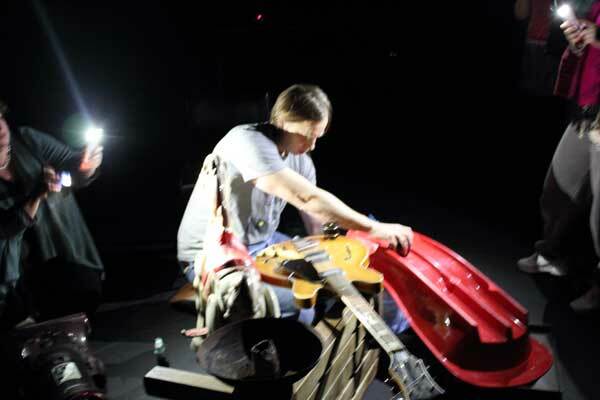 I’ll also discuss some of my work with / against technology in my solo and sound art practice as well my experience leading collaborative arts practice workshops with Ian Spink ( fast + Dirty ) and individually ( Fail Again, Fail Better ) at Guildhall School of Music and Drama and elsewhere. We would like to invite you to the next research seminar of the Creative Technology Research Centre that will be delivered by Chris Ramsey. 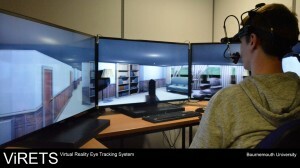 This research project aims to develop a Virtual Reality Eye-Tracking System (VIRETS), capable of displaying naturalistic viewing conditions with high ecological validity and large field of view (FOV) in order to investigate the effects on human gaze behaviour (including head movement) and how this could be advantageous when looking at methods for visual cognition experiments. Static, lab-based eye trackers (head-mounted or desk-mounted) are accurate and easy to calibrate. However, they have traditionally made use of single screen setups with a FOV which doesn’t provide realistic viewing conditions. Furthermore, the head of a participant often has to be restricted using a chin rest and/or bite bar, or, in the case of head-mounted eye-trackers, restricted to small movements, which prohibits naturalistic head movements. While mobile eye-trackers bring eye-tracking research to real world scenarios, allowing for naturalistic head and eye movements and allowing for naturalistic viewing conditions, the method presents a number of limitations, such as lower frequencies and the possibility of dropped frames. Although video footage can be layered with gaze behaviour to show saccadic eye-movement in real scenes, data analysis has to be carried out offline and can be time consuming: Specifically, video footage must be inspected frame by frame, labelled and described in order to analyse what objects in the scene participants attend to. Furthermore using real-world scenarios make it difficult to control all the stimuli presented, making the interpretation of cause and effect relationships difficult. 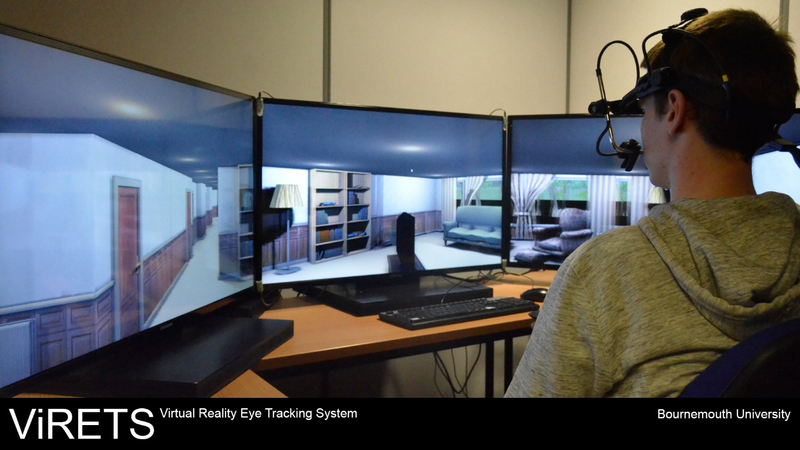 ViRETS aims to address these concerns by combining realistic and immersive VR, head-mounted eye-tracking, motion tracking and the freedom of naturalistic head movement. By these means we’ll investigate how an increased FOV affects gaze behaviour, head movements and performance specifically in the context of visual search and navigation. We would like to invite you to the next research seminar of the Creative Technology Research Centre for the new academic year, that will be delivered by Justice Opara-Martins. Cloud computing offers an innovative business model for organizations to adopt IT services at a reduced cost with increased reliability and scalability. However organizations are slow in adopting the cloud model due to the prevalent vendor lock-in issue and challenges associated with it. While the existing cloud solutions for public and private companies are vendor locked-in by design, their existence is subject to limited possibility to interoperate with other cloud systems. In this seminar we will present a critical review of pertinent business, technical, and legal issues associated with vendor lock-in, and how it impacts on the widespread adoption of cloud computing. The talk in this seminar will reflect on the issues associated with interoperability and portability, but with a focus on vendor lock-in. Moreover, the talk will demonstrate the importance of interoperability, portability and standards applicable to cloud computing environments along with highlighting other corporate concerns due to the lock-in problem. The outcome of this seminar provides a foundation for future analysis and review regarding the impact of vendor neutrality for corporate cloud computing application and services. Abstract: Several human facial animation models have been developed in the last 30 years. In contrast, less attention has been given to animal facial models. Animal facial anatomical features are usually humanised, oversimplified, cartoonised or ignored. 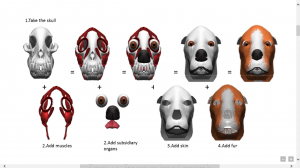 With Londra, our dog facial animation model, we successfully synthesised dog facial expressions such as anger, affection, attention, fear, happiness, yawning and smelling without displaying anthropomorphic features. A preliminary validation suggested that most expressions were recognised consistently. 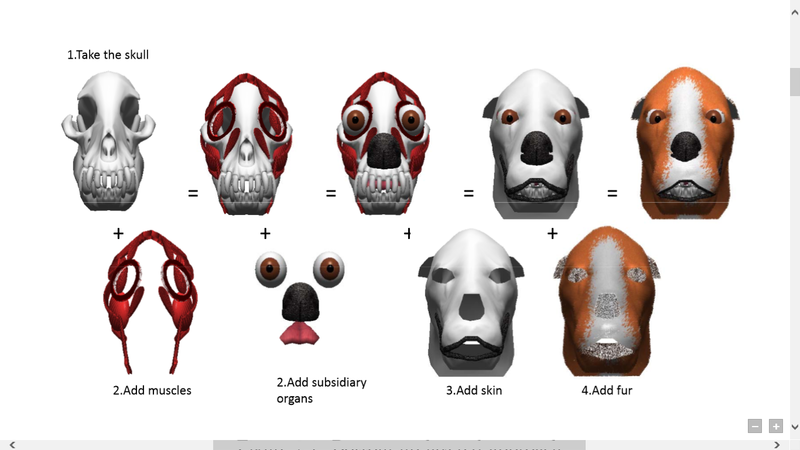 Our contributions include: a simplified model inspired by anatomy; a new bottom up form of the layered approach for the bone, muscle, complementary, skin and fur layers; a Dog Facial Action Coding System to synthesise the expressions; and the Tabulated Sphere Subsets to provide a fast way to approximate collisions between objects with constrained motion. This project was funded by the Pontificia Universidad Javeriana, Cali; The University of Otago and Colfuturo and had the collaboration from the Manchester Metropolitan University. 1. 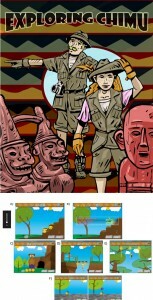 Chimú Interactive: We aimed to make accessible knowledge about the Chimú culture. In this project, we integrated an interactive immersive application on site, an augmented reality mobile application and a database to create a narrative where the player is an archaeologist. For the virtual reality based immersive environment, we required a system that allowed, according to a set script, viewing and exploring the pyramid of Tantalluc and to explore three of its tombs, excavating, cleaning, taking and observing objects and artefacts. 2. Talking to TEO– assisted speech therapy: It is a video game developed and based on verbal therapy and educational objectives, aimed at the rehabilitation of children with early diagnosed hearing disability, and who use aids such as cochlear implants. The software integrates speech recognition for user interaction and benefits from visual feedback.